Apple held its annual shareholder’s meeting at its new California headquarters on Tuesday. Apple CEO Tim Cook discussed investing in the US but provided no details. Shareholders voted to approve all the board members for new terms, and voted against shareholder proposals seeking to make Apple form a human rights committee and to make it easier for shareholders to nominate their own slates of board directors. Apple shareholders overwhelmingly approved management proposals and rejected shareholder proposals that the board opposed at its annual meeting, the first held on the company’s new campus. As in recent years, the vote signals that Apple shareholders giving a vote of confidence to CEO Tim Cook and Apple’s overall strategy. Four proposals backed by Apple passed, including a re-election of the board’s members and a package of compensation for Apple executives. 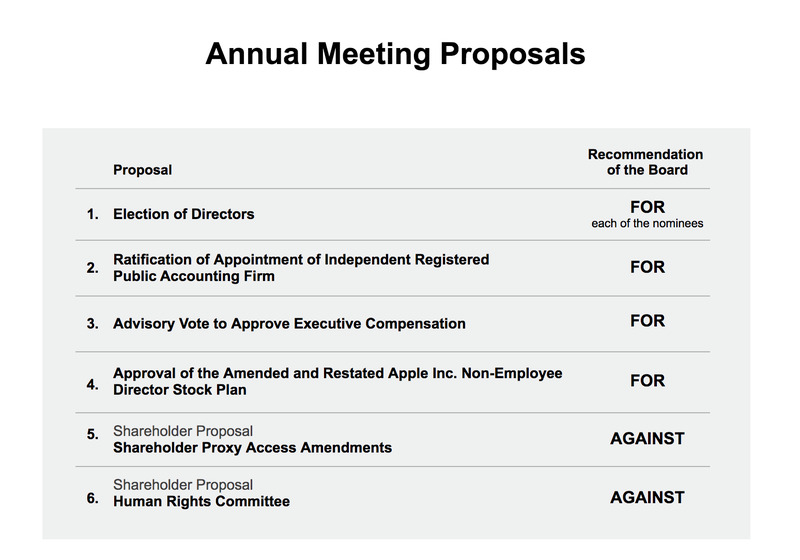 Two proposals from shareholders were overwhelmingly rejected, including a proposal to form a “human rights committee,” and a proposal to reduce the number of shares needed to nominate new directors to Apple’s board. Tuesday’s vote comes shortly after announced a huge quarter with over $US88 billion in sales. “We just finished our best quarter ever in the history of the company,” Cook said in a brief question-and-answer session after the meeting. Shareholders were generally upbeat and Cook appeared animated while discussing funds the recent tax reform that Apple backed, although he did not give details on what Apple planned to use its formerly-overseas funds for, except to “invest in” the United States. “We’re going to pay $US38 billion more in taxes, we could’ve left it were it was and not paid. We want to pay and for wanting to pay we’d like to use the residual profits to invest in this country,” Cook explained. 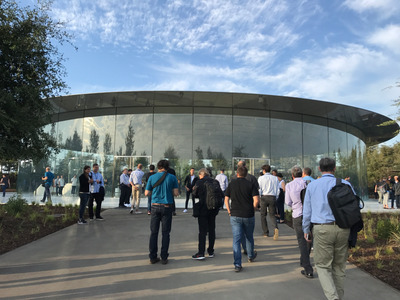 The meeting was also the first held in the Steve Jobs Theatre, which is on Apple’s new $US5 billion campus, Apple Park. Shareholders clamored for a tour of the actual “spaceship” building, instead of the standalone theatre, but Cook said that official tours were unlikely due to the amount of confidential information in the building. “The problem with opening up the main facility for tours is we have so much confidential stuff around and keeping stuff confidential is the bane of my existence now,” Cook explained. All board members were approved with over 95% voting for each board member. Proposal 2 passed with 98.53% voting for it. Proposal 3 passed with 94.93% voting for it. Proposal 4 passed with 96.673% voting for it. Proposal 5 failed with only 32.2% voting for it and 67.8% voting against it. Proposal 6 failed with only 5.56% voting for it and 94.44% voting against it.